So, it wasn't an April Fool's joke that the repair shop would be open on April 1st, but it did not come to pass. Color me Not Surprised. Turns out they are still awaiting their acreditation from Apple, so who knows when they will be open for business. In the meantime, there is no alternative because the Doki shop was transfered here. The wait continues. To make matters more interesting, J's laptop has been on the fritz for at least a year now, and it seems to be getting even more fickle about turning on and staying on. My bruises have greatly faded, and I feel no more aches from the scooter accident. I've started driving it again but not with Sprout. She has gone out with J, though, and yesterday, she declared she is no longer afraid of it. 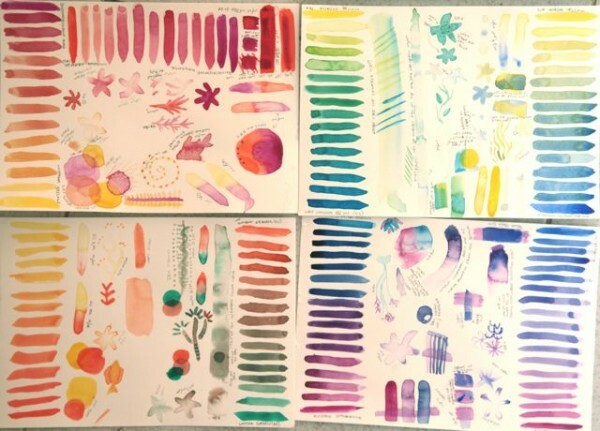 On the creativity front, I've been making watercolor mixing charts and experimenting in general with my new paints. I don't have the energy for storyboarding work right now, so this sort of play is the perfect way for me to learn about my supplies without the stress of "producing something." I began my 8th month on Thursday and have started going through baby clothes to see what we have for Coquille. Verdict: Not much in the newborn department. Only found two onesies for that age. But after the first few weeks Coquille won't be wearing much as temperatures soar. I have other newborn stuff. But where? I thought I knew where we put it after the move but have yet to lay hands on it. Must continue looking. And I have a couple of things I want to sew. Those projects may be the focus for the next snippet. Uggh, the pain of lingering illness :( I hate coughs that hang on. Brave Sprout, getting back on the scooter--and brave you. And what a coincidence about onesies--I have a package of unopened onesies lying on the floor in my study. I got them when I did more dyeing... I know I somehow didn't find time to make anything new for Junebug, but now's my chance to make it up for Coquille! Love the look of all those colors--even just color testing can be pretty. Coughs are soooo hard to get rid of, aren't they?